Karian Parsons took over her grandma’s farm in Hawaii Kai. 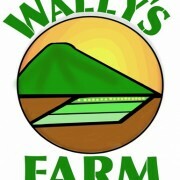 It’s now called Wally’s Farm. Wally is her trusty canine sidekick. Contact for CSA information. They have a U-Pick option Monday thru Sunday, 8am to 3pm – please call first. Restaurant? Please call the farm directly for more details on wholesale options. Follow them on Facebook for updates, new stuff to eat, and nutritional tips (and photos of Wally and his feathery friends).